Tennis documentary The Battle of the Sexes hits DVD this July! Some documentaries are described as a warts-and-all portrayal of an individual, which is sometimes apt. This one is described as a warts-and-warts portrayal of legendary drummer Ginger Baker, and is definitely apt. 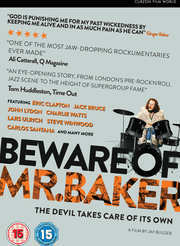 Out 22nd July on both DVD and Blu-ray courtesy of Artificial Eye Home Entertainment, music documentary Beware of Mr Baker hits the small screen and fills it with the rather colourful life of someone who has spent almost his entire life hitting the drums like nobody else. A legendary, era-defining drummer who played with Cream, Blind Faith, Fela Kuti and many other groups, the mad, bad Ginger Baker is as well known for his debauched off-stage antics as he is for his ground-breaking musicianship. Following in the tradition of music documentaries like Searching for Sugar Man, Jay Bulger's award-winning and frequently hilarious portrait of a troubled genius is an insightful, detailed and boldly original film, featuring contributions from Carlos Santana, Stewart Copeland and Lars Ulrich, as well as Baker’s band members Eric Clapton and Jack Bruce.